Stace Fleming, 48, of Morgan, UT was caught and buried on Grandview Peak on January 29th, which is in the Session Mountains, east of the city of Bountiful. He died two days later on January 31. It occurred on a slope called "Grand Slam" by the Wasatch Helicopter Guides, who sometimes ski in the area. He was hill climbing in the area on his snowmobile and on his first descent of a steep, north facing slope, he triggered a very large avalanche and was buried about 5 1/2 feet deep. Apparently, he tried to outrun the avalanche but was bucked off, presumably by hitting the stauchwall of the fractured slab. Wasatch Powderbird Guides happened to be skiing in the area with clients and they noticed the snowmobilers climbing in the area. The next time they looked, they noticed fresh debris with one person on the debris waving his arms. The victim had a beacon and so did his partner, but the partner had not yet located the victim when WPG landed. The guide, Steve Hall, immediately picked up a beacon signal and found the victim within a minute. Since the victim was buried about 5 1/2 feet deep, it took some time to dig him out but they still estimate the total burial time at 15-18 minutes. The victim was not breathing and did not respond to CPR. A medical helicopter was called and Air Med transported him to the hospital. The snowmobile ended up on the surface. The victim was buried horizontally, face up with his head down slope. He was wearing a helmet and face mask. The avalanche fracture occurred around 9,000' on a north-northwest facing slope of about 38-40 degrees in steepness. The slab fractured 3-4 feet deep, 250 feet wide, taking out the whole bowl and descended about 1000 vertical feet. From photos posted on the KSL News web site, it appeared that the avalanche fractured to the ground on faceted snow, similar to all the other avalanches this past week. The avalanche danger rating from the Utah Avalanche Center was Considerable with pockets of High with strong warnings to avoid all slopes approaching 35 degrees and steeper. A Special Avalanche Advisory was also in effect issued through the National Weather Service. The Wasatch Powderbird Guides were the real heros in this rescue. 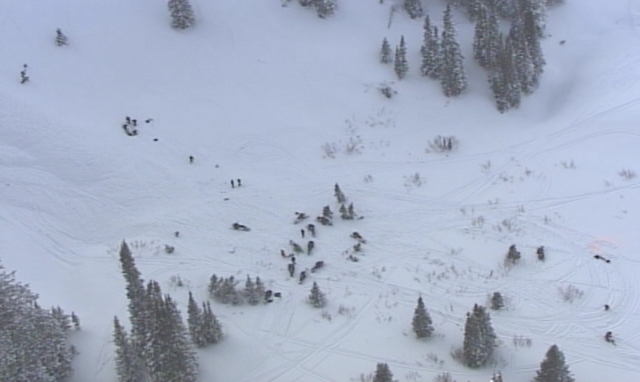 By pure luck, they just happened to be in the area and keeping an eye on the snowmobilers. The fast, and skilled rescue by guide, Steve Hall, was undoubtedly responsible for the live recovery. Although the victim died a couple days later, we should all appreciate the rescue efforts by Wasatch Powderbird Guides, who have abandoned their guided skiing operations many times through the years to rescue other backcountry parties who have gotten into trouble. Our condolences go out to the victim's family and friends. Photo by Dan Gardiner, who was snowmobiling in the area. 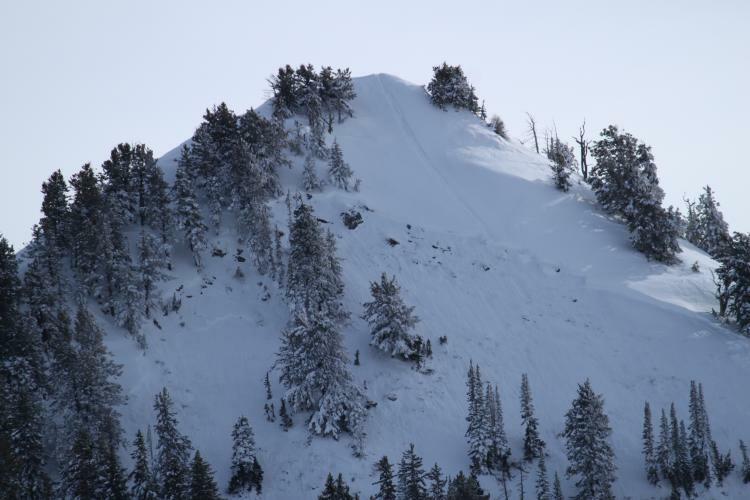 You can see the victim's tracks descending off the summit of a slope called "Grand Slam" by the Wasatch Powderbird Guides. The fracture looks to be about 3 feet deep and over 200 feet wide on a very steep slope of about 40 degrees.